I can one hundred percent relate to today's theme in 33 Days Challenge. Being an Indian, I was very much excited about today's theme. This is the first theme for which i had so so many ideas to choose from. I kinda wanted to do them all but that is not possible. When i thought about what to create to represent India, two things came to my mind Indian Wedding and colors. Though i did Indian Wedding nails with Cheeky jumbo plate C but then i realized that it will be too obvious nail art design for today. So I decided to do a second manicure, this time i chose to represent colors and Indian Textile. I am from Jaipur, capital city of Rajasthan state. Rajasthan is famous for so many things like its culture,history, forts, spicy food, colors etc. 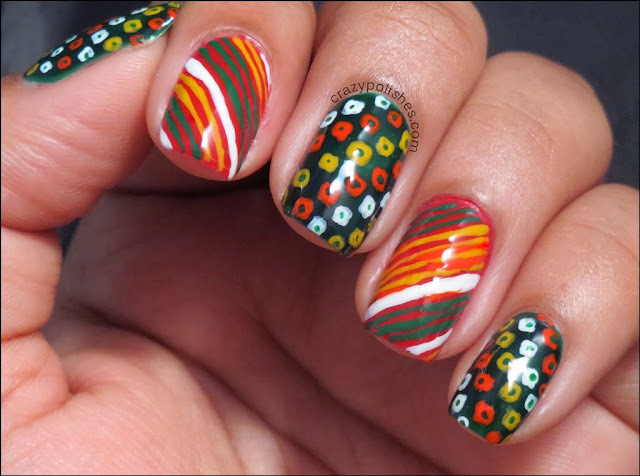 I decide to do a nail art inspired from Rajasthani tie-dye textile. 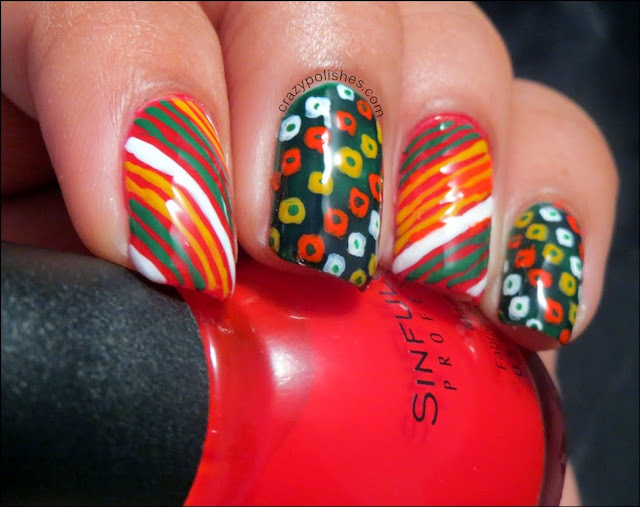 This manicure is inspired from Lehariya and Bandhej(Bandhani) print. 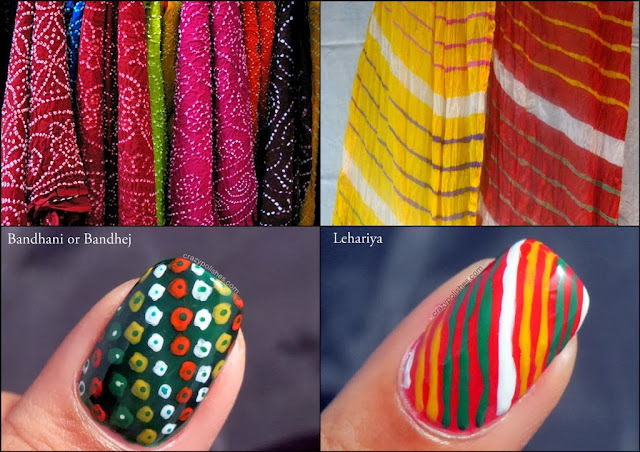 Both Lehariya and Bandhani are Tie-Dye techniques, the basic difference between them is how the fabric is tied for dying it. Lehariya is a wavy stripes pattern on a fabric and Bandhani is square and dots pattern creating different kinda designs on a fabric. Both of them is wear by both men (Rajasthani turban) and women(saree, rajputi poshak, salwar kameez, scarves, kurti, stoles etc). Bandhani is worn all year around on both auspicious and festive occasions as well as casual wear whereas Lehariya is worn in spring time, but people like me wear it whenever they want. I didnt try to make the stripes perfect straight or the square to be perfect squares as both Lehariya and Bandhani doesnt have perfect stripes or square. i guess that made my work easier. 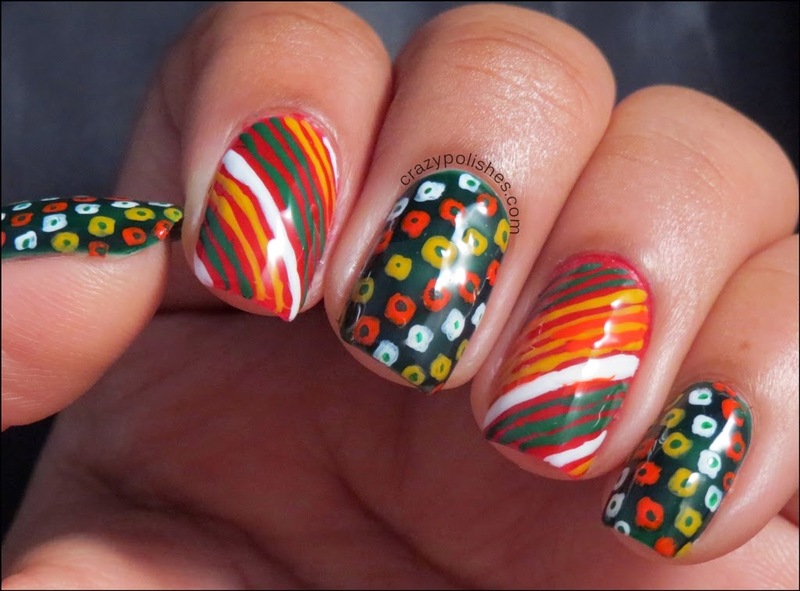 I chose red, green and yellow colors for this manicure because these colors are most favorite colors of Rajasthani women for festive occasions. I hope you like this mani. I loved this theme and thank you CNT for having this theme. Please checkout what other girls did for today's theme.